Home » throat » Narrow Band Imaging Technology for Cancer Detection Now Available at Fauquier ENT! Narrow Band Imaging Technology for Cancer Detection Now Available at Fauquier ENT! Fauquier ENT now offers narrow band imaging (NBI) in the office to better detect cancer and other abnormal lesions in the throat. NBI is an endoscopic imaging technique whereby special filters are used to enhance visibility of vessels and other tissues on or near the mucosal surface. Specifically, it can better "see" dysplastic tissue including pre-cancerous lesions, cancer, and other abnormal mucosal lesions compared to normal light. The way NBI optically enhances light is by utilizing the 440-460nm (blue) and 540-560nm (green) which is better absorbed by hemoglobin causing blood vessels to appear very dark. Typically, capillaries on the mucosal surface are displayed as a brown color whereas veins deeper under the mucosa appear as cyan. Overall, the sensitivity, specificity, positive predictive values, negative predictive values, and accuracy for detecting cancer under normal white light were 41%, 92%, 87%, 82%, and 67%. However, cancer detection increased markedly using high-definition narrow band imaging with values at 97%, 84%, 88%, 96%, and 92% respectively. Throat cancer under normal white light and NBI light. The cancer is in the center of the photo. Overall, NBI increases the diagnostic accuracy by about 22% compared to normal white light. Made by Olympus, the way NBI is performed is via trans-nasal endoscopy whereby a thin black noodle is threaded through the nose and into the throat. 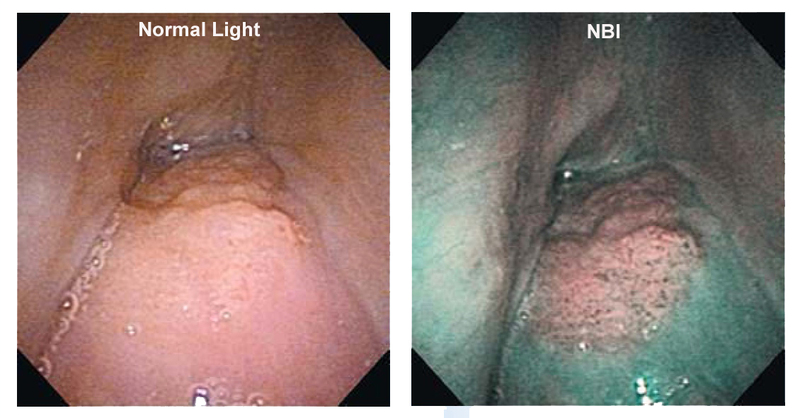 The NBI light can than be activated allowing visualization for any abnormal mucosal lesions. Additionally, the system our office has purchased can also perform high-definition stroboscopy in order to detect subtle vocal cord abnormalities that may lead to a hoarse voice. European Laryngological Society: ELS recommendations for the follow-up of patients treatedfor laryngeal cancer. Eur Arch Otorhinolaryngol. 2014 Sep;271(9):2469-79. Narrow band imaging and high definition television in the endoscopic evaluation of upperaero-digestive tract cancer. Acta Otorhinolaryngol Ital.2011 Apr;31(2):70-5. The diagnostic value of narrow-band imaging for the detection of nasopharyngeal carcinoma. ORL J Otorhinolaryngol Relat Spec. 2012;74(5):235-9.